Returns contents of a diagram. 403 OLDER_FORMAT Diagram saved before 09/27/12 will return HTTP status code: 403. Please open its editing page and save it again. returnValues String The kind of return values you need. Comma-delimited list from following values. “Stencil ID” is used to distinguish stencils within the diagram. No ID’s are set for the stencils added into your diagram before MM/DD/YY. To get this ID, drag & drop the stencils from the Stencil panel again. Please note that the ID will be deleted when the stencil is ungrouped. 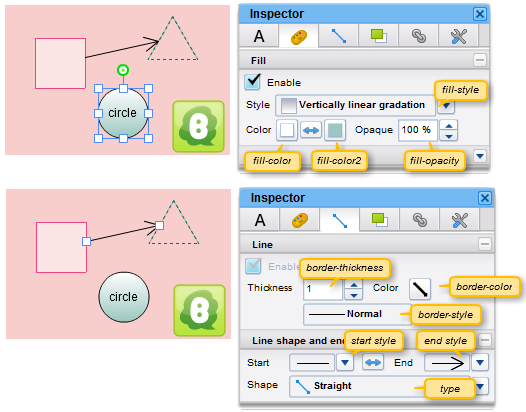 “Attribute” is the value which was set on the right most tab of the Inspector panel. You can set any value here and get it using this API.